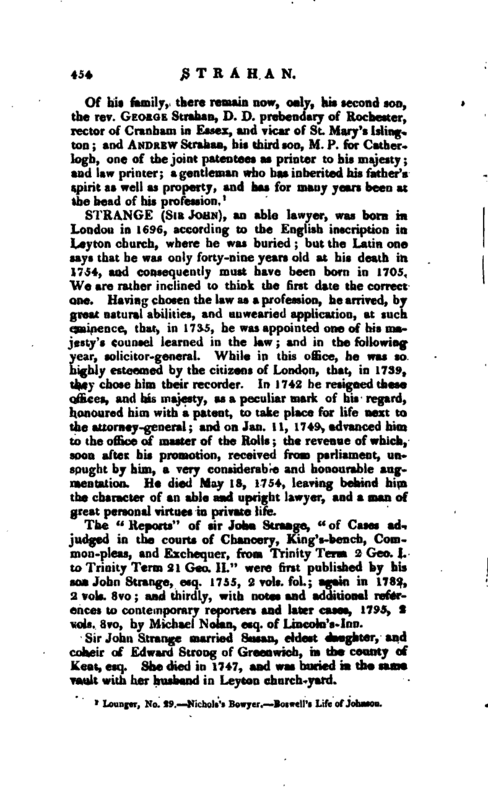 , an able lawyer, was born in London in 1696, according to the English inscription in Leyton church, where he was buried; but the Latin one says that he was only forty-nine years old at his death in 1754, and consequently must have been born in 1705. We are rather inclined to think the first date the correct one. Having chosen the law as a profession, he arrived, by great natural abilities, and unwearied application, at such eminence, that, in 1735, he was appointed one of his majesty’s counsel learned in the law; and in the following year, solicitor-general. While in this office, he was so highly esteemed by the citizens of London, that, in 1739, they chose him their recorder. In 1742 he resigned these offices, and his majesty, as a peculiar mark of his regard, honoured him with a patent, to take place for life next to the attorney-general; and on Jan. 11, 1749, advanced him to the office of master of the Rolls; the revenue of which, soon after his promotion, received from parliament, unsought by him, a very considerable and honourable augmentation. He die:i May Is, 17'54, leaving behind him the character of an able and upright lawyer, and a man of great personal virtues in private life. The “Reports” of sir John Strange, “of Cases adjudged in the courts of Chancery, King’s-bench, Common-pleas, and Exchequer, from Trinity Term 2 Geo. I. to Trinity Term 21 Geo. 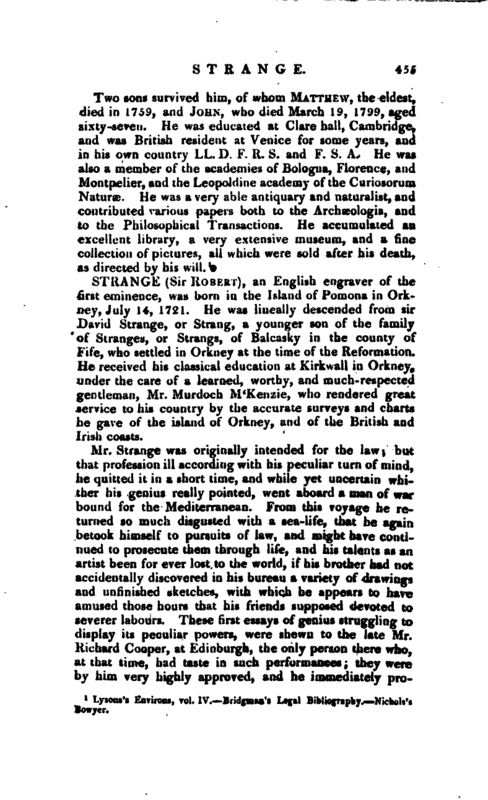 II.” were first published by his son John Strange, Cmj. 1755, 2 vols. fol. again in 1782, 2 vols. 8vo and thirdly, with notes and additional references to contemporary reporters and later cases, 1795, 2 vols. 8vo, by i;;n, esq. of Lincoln’s-Inn. Lysons’s Environs, vol. IV. Bridgnaam’s Legal Bibliograpto. Nichols’s Bowyer.